During a special event held in conjunction with Honda’s Automobile Division, and coinciding with the L.A. Auto Show, American Honda today confirmed its entry in the sport side-by-side segment, unveiling the all-new Talon 1000X and Talon 1000R models. For decades, Honda has set the standard for high-performance dirt bikes with its CR and CRF lineups, and more recently the Pioneer family has introduced unmatched capability to the multipurpose side-by-side category. Now, Honda’s highly anticipated Talon models marry the two worlds, bringing a new level of off-road excitement, precision, performance and quality to sport side-by-side driving. Drawing on countless hours of collaborative development in both two- and four-wheel design and racing, as well as automotive and motorcycle manufacturing knowhow and safety expertise, the Talons push the envelope of what is possible in a production sport side-by-side. Aware that a single offering would be a compromise for some conditions and driving styles, Honda developed two versions of the Talon, each of which works across a broad array of conditions but specializes in a different area of the off-road spectrum. The two vehicles share a common frame and engine but have wheelbases and suspension configurations that are designed to shine in different applications. Both models function at a high level in a wide variety of terrain types, bringing a new level of control, style and refinement to a sport side-by-side market that is hungry for innovation, reliability and an improved driving experience. Pricing information will be announced in January. At 64.0 inches wide, the Talon 1000X is maneuverable and precise. Its 2.0-inch body Fox Podium Quick Switch 3 shocks (QS3) have 5/8-inch shafts and combine with the double-wishbone front-suspension design and 3 Link rear system to offer suspension travel of 14.6 and 15.1 inches, front and rear. The one-piece frame retains consistent geometry even when pushed under the hardest loads, for a controlled, confidence-inspiring ride. A performance-tuned 999cc four-valve Unicam® parallel-twin engine works with Honda’s high-tech, geared Dual Clutch Transmission (DCT), which offers two automatic modes (Drive and Sport), plus Manual with steering-column-mounted paddle shifters. Honda’s I-4WD, the powersports industry’s first and only brake traction control system, manages the amount of slip between the front wheels in four-wheel drive, and electronic brakeforce distribution strategically optimizes brakeforce to the most effective wheels during braking in two-wheel drive. Hill-start assist temporarily holds the vehicle in place when stopped on an ascent, simplifying the process of resuming motion. As a package, the Talon 1000X is incredibly agile and sure-footed, yet it performs admirably in a broad range of applications. Designed to excel when bump absorption and high-speed tracking are the priority, the Talon 1000R shares 85% of its parts with the Talon 1000X, including the entire 999cc parallel-twin engine and one-piece frame, yet it diverges when it comes to vehicle width (68.4 inches—4.4 inches wider than its sibling), wheelbase (5 inches longer than the X) and suspension arrangement. 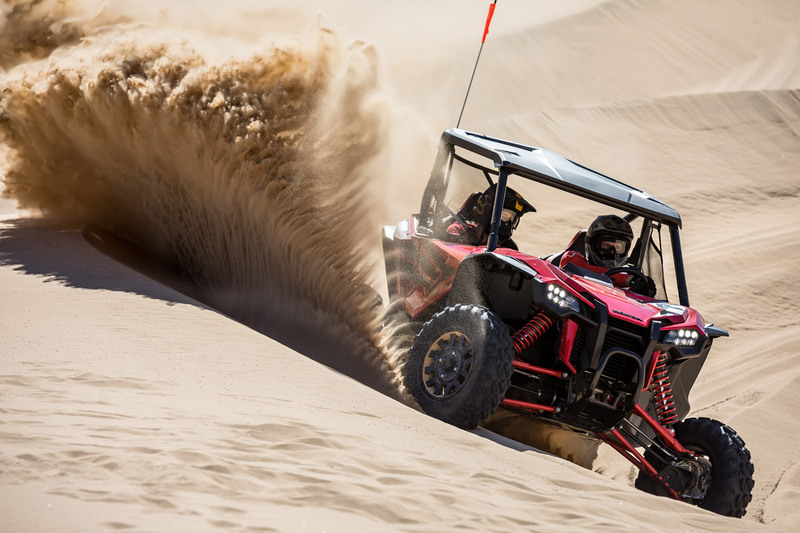 The Talon 1000R has a double-wishbone front-suspension layout and a 4+ Link rear configuration, while the shocks are 2.5-inch body Fox Podium QS3 units that have 17.1 and 20.1 inches of front and rear suspension travel, respectively, or 2.1 and 5 inches more than the 1000X. The combination results in remarkable performance in diverse situations, but is particularly impressive in high-speed, rough conditions. American Honda Motor Co., Inc., is the sole distributor of Honda motorcycles, scooters, ATVs and Side-by-Sides in the U.S. American Honda’s Motorcycle Division conducts the sales, marketing and operational activities for these products through independent authorized Honda retail dealers.